Clear Image Photography specializes in Passport & Visa Photos. We do all countries and we do them right! We are officially recommended by the Canadian Consulate in Seattle and Local US Passport Agencies. Get your passport photos done right the first time! Please don’t be one of our customers who comes in after their “cheap photo” was rejected by the Passport Agency, stressed and out more money than necessary. We have been doing passport photos for 20 years and will make sure you get it done right, the first time! Here are the requirements. 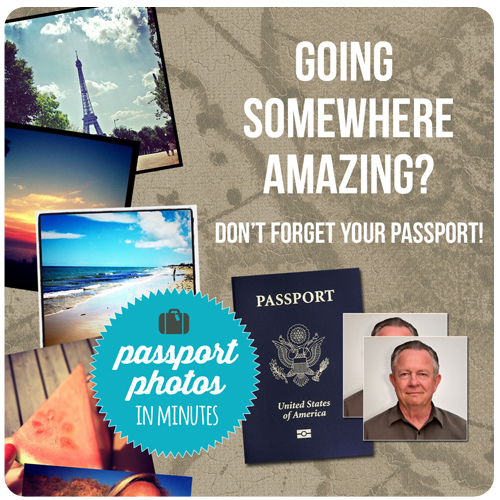 Come in at any time during our open hours, and we will take your photo for U.S. passports or US IMMIGRATION! – 5 minutes and $14.99 later, you can walk out the door with two 2 x 2 photos up to spec with the strictest of government photo regulations. No appointment needed, just come on in! Why Not Online Passport Photos? Why risk getting your photo rejected? Do you have your own lighting setup for a “no-shadow” portrait to upload? Do you really want to go through the hassle – or get a 5-minute guaranteed photo done by professional portrait photographers, like us? Well, for the same reason as pointed out above. Don’t get me wrong, I love Coscto and Clear Image does a ton of business with them, and I enjoy the convenience of the “big-box” stores as much as anyone, but like most things, the difference in product provided by a “clerk” and a professional can be huge. We would love to serve you with the best passport photo in the Seattle and Snohomish County area. These among the most difficult in the world, in fact, over 50% of Canadian Passport applications are rejected! We are the ONLY commercial photographer listed at http://canadapassporthelp.ca/help/commerical-photographers/ and we only charge $29.99. We also offer Canadian Citizenship and Canada Visa Photos. We recommend getting a second set with your first set, because it is cheaper at time of purchase and time saving. This extra set can serve as your international drivers license photo, backup passport photo in case of passport loss, and some countries require visa photos. Marysville City Hall, 1049 State Ave, Marysville – UPDATE: Bummer!….they have closed down for lack of funding. We are starting to see a lot more digital photo requests. The size requirements are usually quite particular. This is by appointment, and the cost is $35, and includes hard copies of your photos, as well as a CD of your image meeting the strict requirements. Please visit this website for information about your requirements based on your country. Dutch Netherlands Passport Photos – these are very difficult because of the biometric computer requirements. Appointment needed please. British / UK passport photos – if we shoot them correctly in our studio the cost is $50 by appointment only. We can shoot them on a white background for $29.99 at your own risk. We can do virtually any country, and we will have the specs for most countries, but may require you bring in specifications. Most foreign passport photos are $29.99 – up to 4 photos depending on what’s required – though certain countries that require special backgrounds (like Guatemala and Indonesia), will cost more. Extra sets are a mere $6.99. Turn-around time is 1 hour with appointment, 1 business day with no appointment. If considering other companies, who may appear to be cheaper, make sure you “grill” them to see if they really know what they are doing and can actually do what it is you are asking. Most countries are much more particular about their photos than they are in the U.S., and require special attention, skill, paper, and processing. We have had many customers come to us from Wallmart and Costco bring in their photos after being rejected by authorities. They are out money and time. Get it done right at Clear Image Studio. These photos can be used for many things, such as resumes, backup travel documents, international visas, press releases, advertisements, international drivers licenses, and gifts.